Melbourne’s Papaflessas Social Club held their annual commemoration of OXI Day last Sunday afternoon at their club rooms in Thornbury. This year’s gathering honoured the personal bond created between the peoples of Greece and Australia in WW2. And it was an opportunity for Papaflessas to be congratulated on its support for the erection of the new Anzac Memorials at Pylos and Methone in May this year. It was my honour to make the presentation at the gathering. I began with the story of Greek Day in Melbourne. 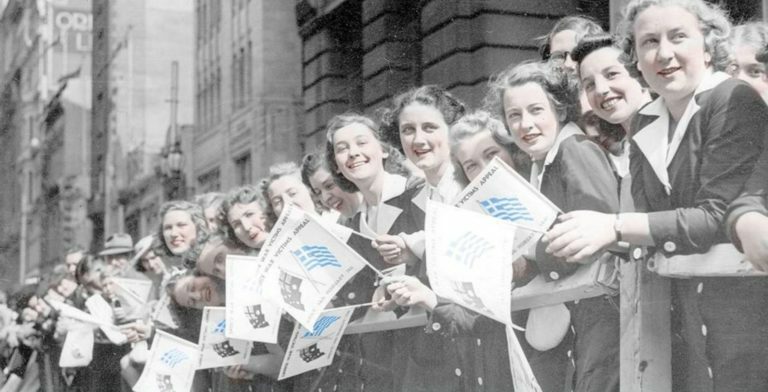 Before Australian troops had even set foot in Greece to help in its defence, over 100,000 people had come into Melbourne’s Swanston Street on 14 February, 1941 to take part in Greek Day – a day to celebrate the alliance between Australia and Greece and a day to raise funds to help the civilian victims of the war that had begun with the Italian invasion in October 1940. Melbourne’s fledgling Greek community joined with over 700 volunteers who made the day a great success. These efforts would be reciprocated by the hundreds – if not thousands – of ordinary Greek civilians who gave welcome and support to the Australia troops who came ashore at Piraeus in March and April 1941. One of those who came to Kalamata was Captain Albert Gray from Red Cliffs near Mildura in Victoria, who would take part on the last battle of the Greek campaign on the mainland – the battle of Kalamata waterfront on 29 April, 1941. Leading one of the two groups in the attack on German positions on Navarino Street, Albert was awarded the Military Cross for his bravery that day, New Zealand Sergeant Jack Hinton being awarded the Victoria Cross and Australian Private Max Wood the Military Medal. It was a great pleasure of mine to be able to tell this story to an audience that included three members of Melbourne’s Greek community with strong connections to Albert’s home region – Nola Radiotis, Trevor and Soula Vrettos. I look forward to working with Trevor, Soula and Nola to create greater awareness of Red Cliff’s link to the Battle of Kalamata waterfront. 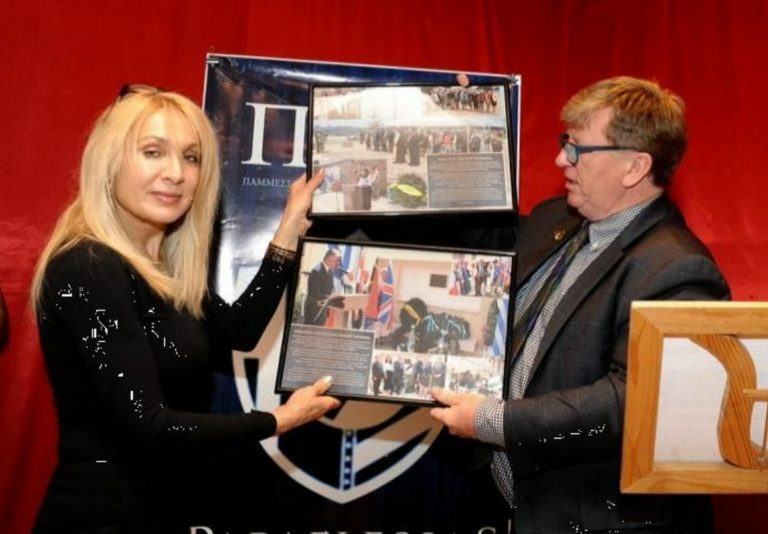 Jim Claven presents Papaflessas Secretary Betty Kosmas with the commemorative posters on the unveiling of the Pylos and Methone Memorials in May 2018. I then spoke of Horsham’s Private Syd Grant who never forgot the support of the local Greek community as he escaped German captivity at Kalamata, finding safety in the village of Trachila in the Mani. It was while there that Syd took a number of memorable photographs, capturing on film the help of the local villagers for the escaped Allied soldiers. Along with other Allied soldiers, Syd was evacuated from Trachila by the British warship HMS Hero and returned to Allied lines. He survived the war and would later name his farm in Victoria – Kalamata – in honour of the Greek people who had helped him. Last month Papaflessas’ own Paul Sougleris was able to identify the hideouts and some of the villagers who helped Syd in 1941 during his research trip to Trachila. The connections between the Messinian region continued after the end of the Greek campaign. Most memorably it was the people of Pylos and Methone who sought to help the over 3,000 Allied soldiers who came ashore after the torpedoing of their Italian POW transport ships, the Sebastiano Veniero At Methone in December 1941 and the Ninio Bixio at Pylos in August 1942. Amongst the hundreds of Australian soldiers aboard was one young Essendon-born engineer, Sapper Bill Rudd who had long sought to have erected memorials to both these tragedies. And so it was that late last year Papaflessas joined with Melbourne’s Panpyliaki Brotherhood Navarino and helped make Bill’s dream a reality. In record time the Pylos and Methone Memorial plaques were created, transported to Greece and installed by the Municipality of Pylos-Nestor in prominent locations. It is only with the support of Papaflessas and its membership – along with that of Navarino – that these important new additions to Greece’s emerging Anzac trail could be created and erected. On behalf of Anzac veteran Bill Rudd, I thanked the community for their support. Melbournians line Swanston Street during Greek Day celebration on 14th February 1941. Photo: The Argus (Melbourne), 1941, with colour added. State Library of Victoria Collection, Ref H98.100/3448. I also outlined that work that is being undertaken by other representatives of Melbourne’s Greek community organisations to expand Greece’s Anzac Trail. Along with the Lemnos Gallipoli Commemorative Committee’s erection of the Australian Pier Memorial at Mudros on Lemnos, I am working with Melbourne’s PanKorinthian and PanArgoliki communities to commemorate a number of important Anzac sites across the region that have no memorial. These include the site of the Battle of Corinth, where Australian and New Zealand troops played an important role in the valiant defence of the Corinth Canal in April 1941 and the Church in Argos where Australian and other army nurses sought sanctuary and safety from German air attack during their retreat to the evacuation port of Nafplio in April 1941. These are only two of a number of important Anzac related sites across the Peloponnese being researched for new memorials – watch this space. Litsa Athanasiadis gave a brief address on the success of the George Treloar Memorial Committee, whose successful community fundraising will see a major new memorial erected to Ballarat-born Major George Devine Treloar who assisted over 100,000 Christian refugees to settle in Greece following the Asia Minor catastrophe. 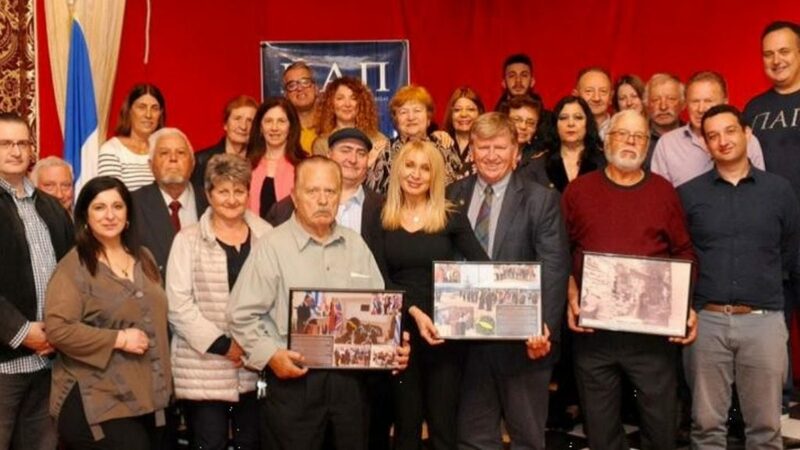 Litsa invited all present to attend the unveiling of this commemoration of an Australian who played such an important humanitarian role in the history of modern Greece. The event concluded with an address by Ms Kosmas who spoke of how she was moved by the presentation on the personal aspect of the Hellenic link to Anzac. She thanked all for attending this important and emotional event.